Why are smokers treated so badly? When justifying the proposed introduction of plain packaging and trying to legalise moral, ethical conduct in South Africa, the Minister of Health Dr Aaron Motsoaledi can seem quite comical to those who understand the concepts of constitutionalism, human rights culture, and liberty. The government and the Health Ministry, in particular, is attempting to enforce regulations on cigarettes, specifically, to implement plain packaging. Far from the packaging being “plain”, to discourage smokers, it would mean that known and recognisable branding would no longer be allowed on cigarette packets, all boxes would be a basic black and feature large, coloured pictures of smoking related deformities or disease, for example, decaying teeth, destroyed lungs, or sickly people suffering from cancer. Plain tobacco packaging, also known as generic, standardised or homogeneous packaging, refers to packaging that requires the removal of all branding (colours, imagery, corporate logos and trademarks), and permits manufacturers to print the brand name in a mandated size, font and position on the pack, in addition to the health warnings and other legally mandated information such as toxic constituents and tax-paid stamps. 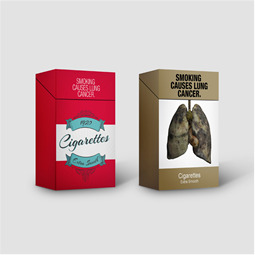 The appearance of all tobacco packs is standardised, including the colour of the pack. While either side of the debate can find studies to support whether plain packaging ‘works’ or not, no one wants to engage on whether it is a moral endeavour. If you believe that the state ought to exert ever more control over our lives, you will agree that such measures are moral. The pragmatic nature of something does not determine whether it is moral or not – we should instead examine how far we are willing to allow the state to dictate to us what we may or may not do. Some argue, of course, that secondary smoke is harmful to non-smokers and, therefore, non-smokers should be protected. Grown non-smokers who are afraid of second hand smoke are quite capable of protecting themselves by just distancing themselves from the smoker. After all, if you are afraid of being hit by a car, you don’t stand in front of a moving vehicle. When it comes to children, their exposure to second-hand smoke would amount to child abuse and they should then be protected in the same way as they are from other forms of child abuse. Drivers of cars can and, sadly, sometimes do cause the deaths of innocent victims but drivers, in general, are not treated as vindictively as are smokers. Smokers should be seen as a persecuted minority and, on principle, we should all be fighting for their rights and freedoms because the principle we have to continually strive and fight for is freedom – not the virtues of smoking. The first and only country, currently, to have plain packaging is Australia. The results of studies on the effects are divergent. Some studies say it has reduced smoking, others that it has not impacted smoking levels. Either way, the effects are not appreciable. Plain packaging neither works, nor does it respect the rights of producers and consumers alike. Once this universal plain packaging movement is allowed in South Africa, further Constitutional rights will be violated. Society and business sectors at large criticised this new proposed method. They see plain packaging not as a solution to health challenges caused by smoking, but that a lack of education and public awareness is the problem. Education on the harmful effects of smoking would be far more effective than being pushed around by the heavy hand of the state.